Awesome. 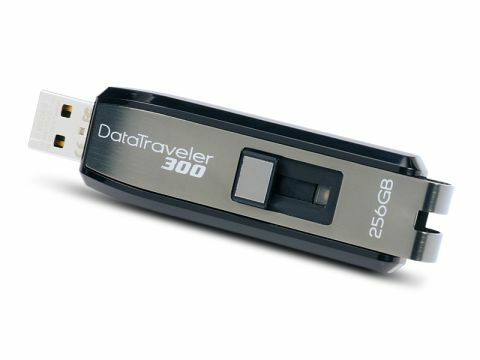 The Kingston Data Traveller 300 has 256 whole gigabytes of storage in a tiny form factor. I remember back in the early days of computing when a 256MB hard drive cost £400 and a goat. But now you can pick up a 500GB portable hard drive for £50. The goat is happy. At £500, it's really good value, IF YOU'RE BILL BLOODY GATES. If you don't happen to be the head of Microsoft, it's probably quite a lot of cash to be spending on a USB drive. You could buy 256 individual 1GB drives for about £100. We can see the appeal, though, and if the price comes down a bit (actually, a LOT) it might be worth investing in. If you're one of those poncy media types who HAS to have high-definition media files or giant bitmaps with you at all times, it might be worth it. But, then again, I've never met a poncy media type who doesn't own a manbag with more than enough space for a cheapo portable drive. It's not like it's even a particularly good drive. Copying a 750MB file took far longer than it did to our Sandisk Cruzer drive, which means copying a 256GB file could potentially take days. The chunky USB-hogging design is annoying too. But then, if you're investing £500 in a USB drive, you can probably afford a gold-plated USB hub hand crafted by virgins in Tahiti.